The fol­low­ing arti­cle comes to Unbound in response to our recent cov­er­age of the divest­ment debate, brought before the United Methodist Gen­eral Con­fer­ence ear­lier in May and com­ing before the Pres­by­ter­ian Church (U.S.A.) Gen­eral Assem­bly at the end of this month for a vote. San­dra Tamari is a Palestinian-American from Glen Car­bon, Illi­nois, and a Chris­t­ian. In get­ting to know her this past year I found her to be gra­cious and accept­ing, really the quin­tes­sen­tial rep­re­sen­ta­tive of her par­tic­u­lar faith tra­di­tion, the Quakers. Because the United Methodist Church has been attempt­ing to respond to the call of Chris­tians in the Holy Land for help in find­ing non-violent solu­tions to the con­flict there, she agreed to make some calls to our elected del­e­gates prior to our Gen­eral Con­fer­ence in May. She urged them to vote for the res­o­lu­tion to divest from com­pa­nies sup­port­ing the occu­pa­tion of Pales­tine, and reported enjoy­ing her conversations—so much so that she decided to go to Tampa for a few days her­self as part of the effort to pass a divest­ment resolution. San­dra Tamari, a Quaker, mother of two, and mem­ber of the St. Louis Pales­tine Sol­i­dar­ity Com­mit­tee, was detained at Tel Aviv’s Ben Gurion air­port last week and aggres­sively ques­tioned for over eight hours before being taken to a deten­tion cen­ter and deported back to the United States. Dur­ing ques­tion­ing, Israeli secu­rity demanded she open her per­sonal email account and accused her of being a terrorist. Tamari, a vocal advo­cate for Pales­tin­ian rights and the end­ing of Israel’s occu­pa­tion of Pales­tin­ian ter­ri­tory, was attempt­ing to travel to Israel and the occu­pied West Bank to par­tic­i­pate in an inter­faith del­e­ga­tion involv­ing Pales­tini­ans and Israelis work­ing for peace and coex­is­tence. She was recently involved in the cam­paign urg­ing the United Methodist church to adopt selec­tive divest­ment from com­pa­nies that profit from the occu­pa­tion, co-authoring a widely cir­cu­lated op-ed in the Tampa Bay Times last month dur­ing the United Methodists’ Gen­eral Con­fer­ence. It seems clear that Israel’s treat­ment of Tamari is related to her work on behalf of Pales­tin­ian rights. No one else from Sandra’s del­e­ga­tion was deported. 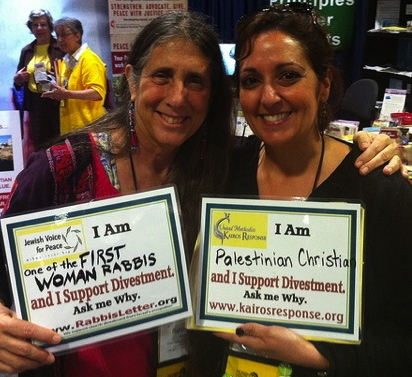 I fear that Sandra’s sim­ple agree­ment to engage United Methodists on the issue of selec­tive divest­ment from com­pa­nies prof­it­ing from the Israeli occu­pa­tion con­tributed to Israel’s sin­gling her out for depor­ta­tion. As one of the lead­ers in this move­ment, it is very dis­tress­ing to think she was pun­ished for sim­ply try­ing to edu­cate and help United Methodists do the right thing in Tampa. As an Amer­i­can cit­i­zen, I’m angered that a fel­low cit­i­zen would receive such treat­ment from a sup­posed ally. Like the rest of those sup­port­ing divest­ment at Gen­eral Con­fer­ence, I was quite dis­ap­pointed the divest­ment res­o­lu­tion failed. It’s clear our church is still divided on the par­tic­u­lars of divest­ing our pen­sion funds. Even so, by our deci­sion to boy­cott prod­ucts pro­duced by ille­gal set­tle­ments, we are now declar­ing more firmly than ever that the occu­pa­tion of Pales­tine is unjust. We are stand­ing with oppressed peo­ple, which is what I believe Christ would have us do. As we talked after her depor­ta­tion, I could tell that San­dra is hope­ful that the Chris­t­ian com­mu­nity in the United States—the lib­er­als, the con­ser­v­a­tives, the moderates—is begin­ning to see and under­stand what’s really hap­pen­ing in the land we all call holy. Sign a peti­tion sup­port­ing Sandra. Learn more about the United Methodist Kairos Response. Read “The Win We Didn’t Expect” by John Wag­ner in response to the deci­sions of the UMC Gen­eral Con­fer­ence, while map­ping a way forward.